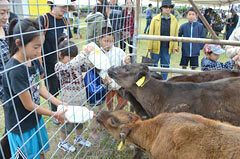 On February 24, children give milk to a calf at the multipurpose square on Kuroshima Island, Taketomi-cho. On February 24, the 21st cattle festival was held at the multipurpose plaza on Kuroshima Island, Taketomi-cho, in Yaeyama. As many as 3000 people took part in the festival, enjoying events such as a lottery in which people win pregnant cows. At the stalls, they tasted the food of Kuroshima, which is a livestock-farming island. The most popular dish was grilled beef shanks, which sold out as soon as they went on sale. Those fortunate enough to buy some enjoyed the taste of the juicy meat. Many tourists played games such as rolling a pasture grass roll, in which teams of six people competed with each other in rolling about 400 kilograms of grass, and an obstacle course in which a pair of a man and woman participate. Families also enjoyed the opportunity to interact with cattle by nursing calves and watching a demonstration of cattle hoof trimming.